Director/Writer/Producer Jessica Oreck chatted with me about her career and what we can expect from this talented documentary filmmaker. Jessica and I started our conversation by talking about two filmmakers who gave her the motivation to pursue the trade as her career. Sir David Attenborough‘s The Private Life of Plants was the first major influence on a young Jessica. It wasn’t so much the series itself – it was that watching the series was the first time I was really exposed to respectable and well-made nature films. At that point, biology was my favorite subject, but I knew I didn’t want to be a scientist (I don’t have the patience for specialization). I also love education, but I am terrible with kids, so teaching was out of the question. 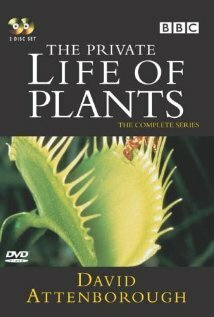 When I saw The Private Life of Plants in my high school botany course, I felt like my life’s path had been illuminated. French documentary filmmaker Jean Painleve would also aid Jessica in her search for a career and this time the influence would come from a person close to Jessica. I was actually introduced to the films by my boyfriend/cinematographer Sean Price Williams. Sean is a connoisseur of obscure films. When we met in 2004 he showed me a videotape from who knows where. The first short I saw was L’Hippocampe, and I was instantly in love. Eventually Sean bought me all three French collections of Painleve’s work, and then Criterion put out that beautiful DVD. So now I have them all, plus posters and several books by and about him. He really is a hero. Jessica grew up in New Orleans and Boulder, Colorado, but it was her move to New York City that would spark her full connection to nature. Amongst the urban sprawl of the Big Apple, Jessica would find a home at the American Museum of Natural History. AMNH is like my second home. My experiences there have been wonderful and have really influenced my life outside the museum. I started as an intern in Science Bulletins, which produces a lot of the video content in the permanent exhibits. Eventually I moved over to Living Exhibits, where I work with a team of animal keepers who double as docents in the Butterfly Vivarium. We care for whatever animals happen to be on exhibit. Some years are busier than others and this year happens to be a slow one, so my boss has been spectacular about letting me take time off. Working as a docent in the Butterfly Vivarium is like watching a controlled experiment unfold in real time. I see hundreds of people move through the Vivarium every day, and I watch them get up close and personal with insects. Apart from the subjects, there are no variables in the experiment. I think this allows for a thin yet revealing slice of insight into human consciousness – one with which I am endlessly captivated. Jessica explained the real passion behind what she is trying to showcase in her films. The questions I am constantly asking myself come from always having lived in a city. How does rarified nature fit within contemporary culture? How can we make nature accessible to whole generations whose lives are driven by video games and thermostats? And how can a filmmaker make the desert real for someone who has always had air conditioning? In the Butterfly Vivarium I hear the phrase, “Is it broken?” more often than I hear “Is it dead?” I think this reveals a lot about our society. My passion as a filmmaker has always been ethnobiology – the way cultures interact with the natural world. I make films, in part, for people like me, people who have spent their lives in cities, looking at spring buds and fall colors through dirty windows and carefully landscaped parks. I want to share the immediacy of nature – not the idealized, simplified, and anonymous version we see in nature programs on TV, but a nature populated with human characters and personal connections. It is my hope that my synesthetic, stylistic approach will jolt people out of the passive, superficial way in which they normally watch films and encourage them to spend a bit more time contemplating man’s place in the natural order of things. Its this love of ethnobiology and how to showcase those cultures that pushed Jessica to create her production company Myriapod Productions. Notice the name Myriapod. Well Jessica’s fascination with bugs has been something she’s shown for a long time. I have always loved insects and other arthropods. My parents say I was collecting cockroaches before I could walk. 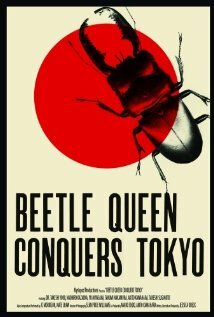 All this fascination would lead to Jessica’s feature film Beetle Queen Conquers Tokyo. 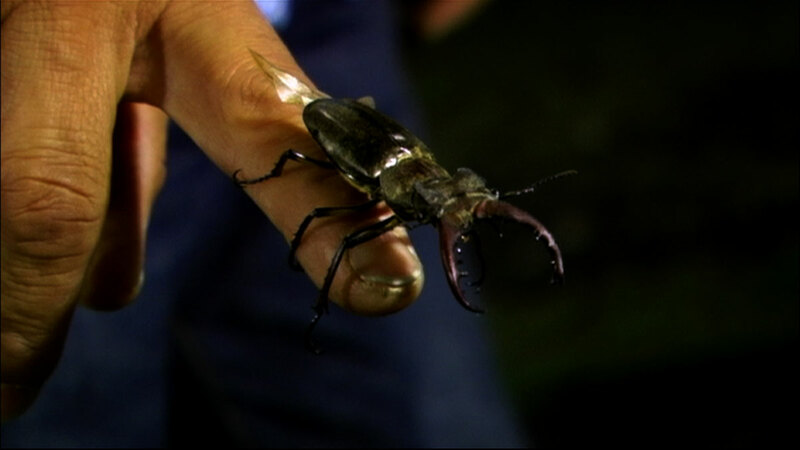 As soon as I learned about the Japanese enthusiasm for insects, I knew I would make a film about it. Very serendipitously, I met Akito Kawahara – our co-producer – an entomologist who spent his childhood collecting insects in Japan. Akito was immediately onboard with the project and helped us make many of our initial connections in Japan. Akito acted as our producer and translator for the first two weeks of shooting. The remaining three weeks, my good friend Maiko Endo took over for him. Akito with net in hand. The film would showcase bugs that may scare you. Or bugs that may mystify you. But the real treat to me about the film was its showcasing of Japanese youth’s fascination of insects. 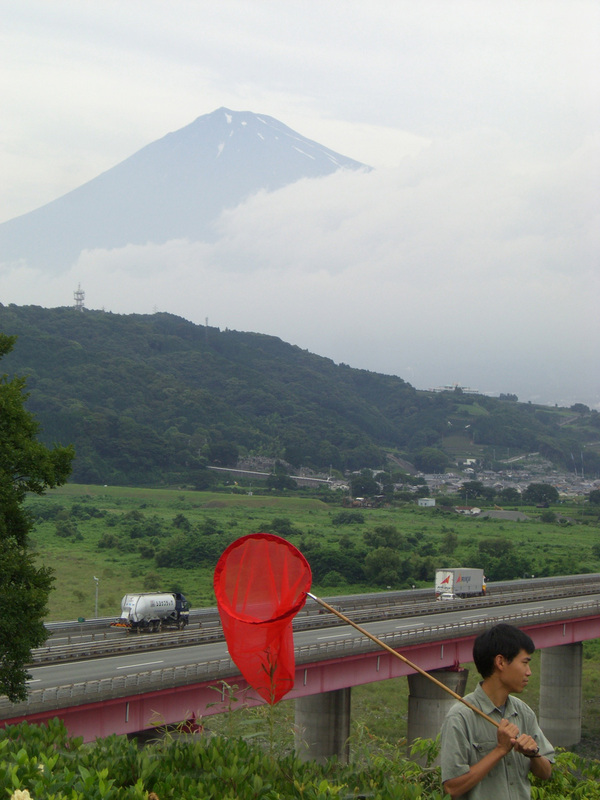 A Japanese child’s relation to insects isn’t that different from an American’s child connection – if you catch them young enough. Most young children don’t have an innate fear of bugs (from my experience watching thousands of them pass through the Butterfly Vivarium). It isn’t until they see the dad flinch or the mom scream that they learn disgust or fear. 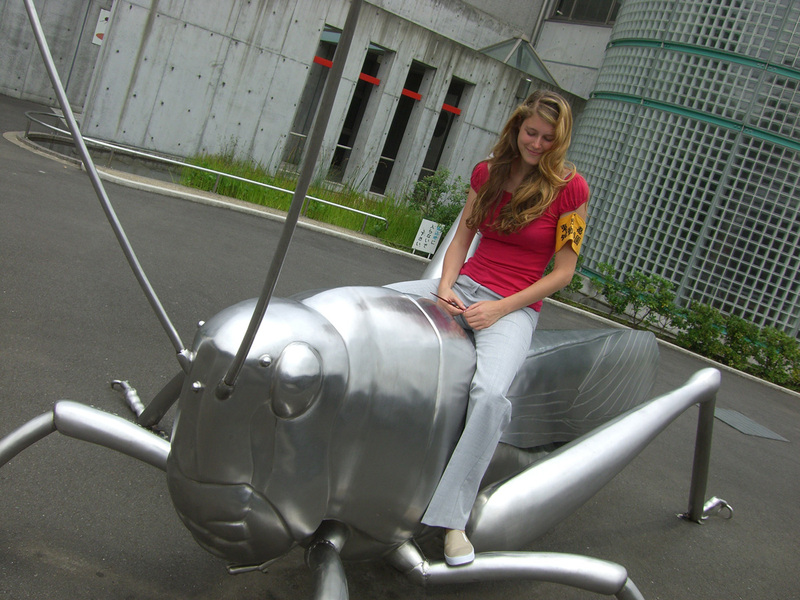 What’s different with a Japanese child is that they are encouraged to explore the insect world. They keep them as pets, their dads take them on insect collecting trips, and they travel halfway across the country to watch the fireflies emerge at dusk. Of course I am really generalizing – but the phenomenon is generally quite widespread. I believe that a Westerner’s view of the natural world is, in part, dictated by the cultural heritage of what I call the Judeo-Christian syndrome, through which we see the world as a linear chain of progress, culminating in the human form and bestowing the power of control to the animals with the least sense of balance. 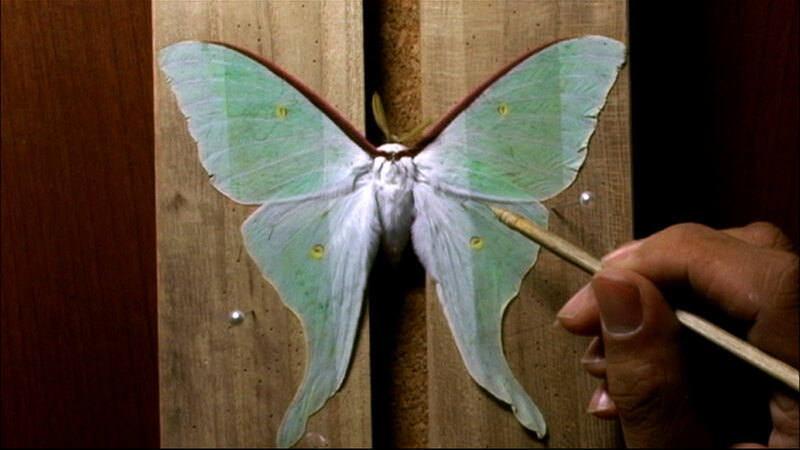 But I also think that an individual’s understanding of the natural world is most directly absorbed by observing the behavior of the people they admire, and that that is why this connection to insects continues to thrive in Japanese culture. As a Texan I always love to hear that our state played an impact in a film-maker’s world. Jessica premiered Beetle Queen at South by South West and from there would take her film across the country and world showcasing it to millions of people. Jessica talked about that initial spark from her trip to Austin and shouts out to one of her favorite festival stops. SXSW was the first time I had ever shown my work to any audience. So mostly it was just stressful. But eventually, after a lot of practice, I learned to enjoy myself on the festival circuit. I really enjoyed bringing Beetle Queen to the Maryland Film Festival. Overall Jessica would take home the Special Jury Prize for Artistic Vision in a Documentary from the CineVegas International Film Festival. She’d also garner a nomination for the Truer Than Fiction Award from the 2010 Independent Spirit Awards. Jessica has a slew of projects in varying stages. She has a short film currently at Sundance and two features she’s finishing up on. We’ll start with her unique trek into the forests of Eastern Europe for the film The Vanquishing of the Witch Baba Yaga. The variety and depth of cultures in Eastern Europe has always fascinated me – the languages, the traditions, the stories. And mushrooms, of course, falling into that category of misunderstood living beings (like insects), have always appealed to me as well. Like my Beetle Queen research, ideas about the relationship between nature and culture just sort of fell into place. Though, as my research has moved forward, the focus of the film has shifted away from mushrooms and towards the general mythology that surrounds the forest. Being in Eastern Europe was magical. It was like moving through time. We shot about 16 hours of super 16 film. I haven’t actually sat down to edit, but I have been watching the footage and laying out different structures on paper. I’ll be doing an artist residency in March, so I am counting on that to give me the time I need to focus and really dive in. When you are working on so many projects simultaneously, it is easy to push the hard stuff to the back burner. Even though it may well be on the back burner, that doesn’t mean there isn’t an awesome teaser trailer!!! The other feature that Jessica is finalizing is a film called Pipe Fire, that looks at the traditional reindeer herders in Finnish Lapland and in particular one family of herders. Jessica discussed this intriguing project. I just happened to meet the Aatsinki family when I was planning The Vanquishing. Since I didn’t want to give up either project, I decided to tackle both at once. 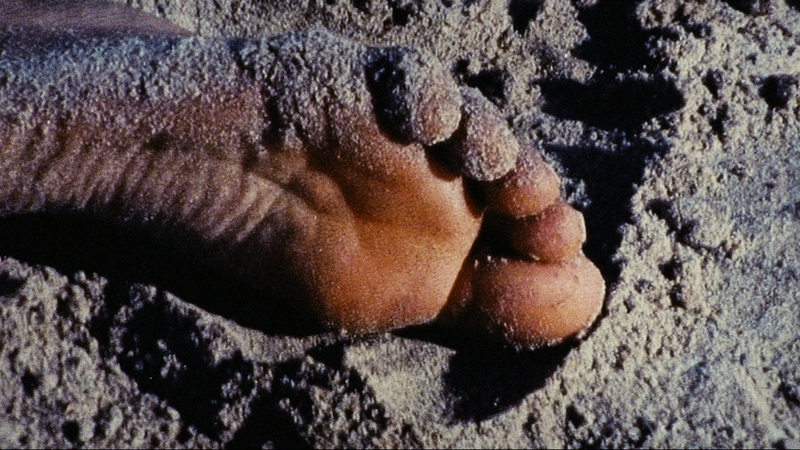 The foundation of the film is, once again, based in ethnobiology. I’ve been following a family with a completely different set of skills and senses than I have ever encountered. At the same time, the film also ties in with my deep love of the mythological American west. Today, the closest thing to the American hero on horseback exists only in these incredibly remote places. I really wanted to film the family for a full cycle of the seasons, so I started shooting in September 2010 and will be traveling back there several more times over the course of a year. It will be awhile before I’m able to start editing, however, since I’m using my time away from Finland to focus on The Vanquishing. With those projects still finalizing, Jessica still kept busy enough to enter her short film, Venus, into Sundance!! Now trust me I tried to get her to open up about this film. So far all there is about the film is the teaser line of. I attempted to get more from Jessica and she brought up Tolstoy to make a great point. Wasn’t it Tolstoy, when asked about Anna Karenina in an interview, who said that if he had to express all the things he wanted to express in the book, he would have to write the same book, word for word, all over again? I know exactly how he felt. That’s all there is to say. You’ll just have to see and hear it! Of her short stint at Sundance Jessica gives an honest answer to what it was like out there. I was only there for a few days. I was really excited to be part of Sundance, but I can’t say I was so thrilled to be back in ski country – I have a bad relationship with skiing. But the festival itself was really a blast. Well it was a blast to chat with Jessica and if you’re looking for a fun, unique and vibrant film-maker to keep an eye on, then remember the name Jessica Oreck.